Business Developer takes charge of facilitating business growth and consolidating the business’s position in the market. 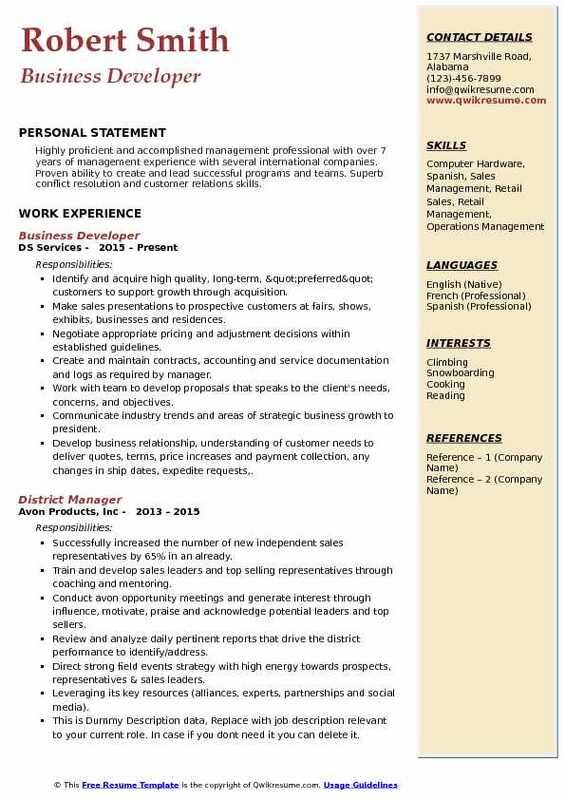 Responsibilities highlighted normally on a Business Developer Resume include identifying potential clients, performing competitive analysis, promoting new product development, preparing reports, developing growth strategy, arranging meetings with prospective clients, preparing sales Contracts, keeping track of revenue, invoices and sales, building long-term relationship with current and potential customers and transforming entry level staffs into a valuable salesperson. Those seeking to work in this line of operation should have proven sales track record, proficiency in MS Office and CRM software, market knowledge, time planning, and negotiation skills. Ability to build rapport is an additional credit. Business developers can come from any educational background, but many of the best Business Developer Resumes portray a Bachelor’s degree in the field of Business Administration, Sales or its related field. 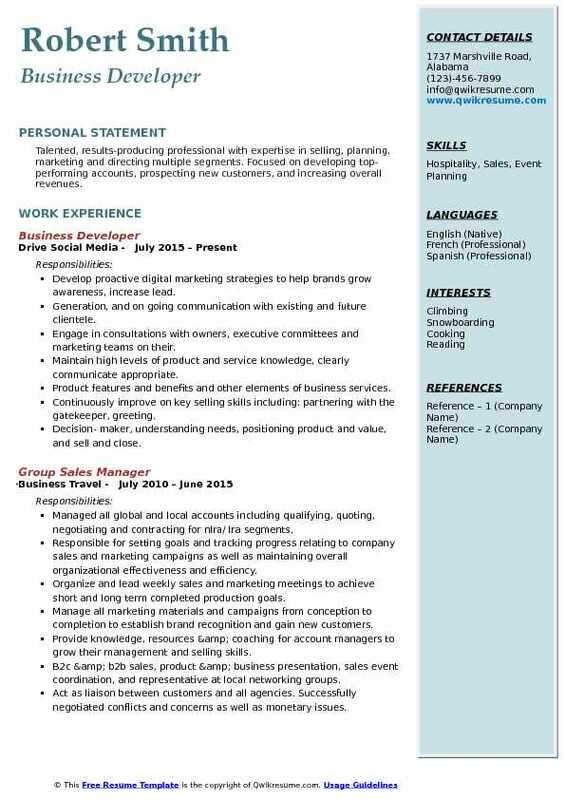 Objective : I am an articulate, creative, and engaging business development executive that thrives in a high growth, high energy team oriented environment. 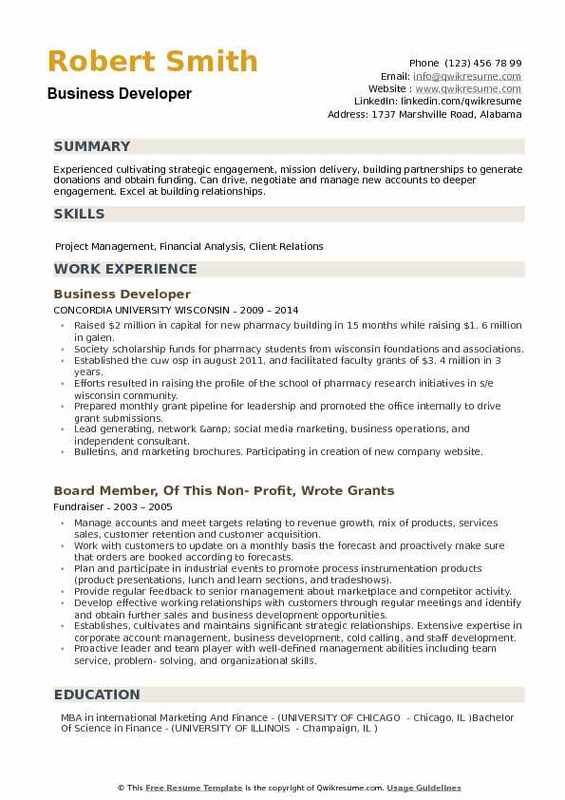 My current objective is to obtain a full-time permanent position, leading to a challenging career in which I can utilize my education and experience to make a positive and valued contribution to your organization and industry. Work with the franchise development director to identify strategic targets for relationship building that could foster high quality franchisee leads. Develop relationships through various forms of outreach with strategic targets for the purpose of generating a pipeline of high quality leads for franchisees. Maintain the relationships through outreach such as hosting educational sessions or using campaigns to constantly update the targets on system benefits. Travel and present as required to foster relationships in key market areas. 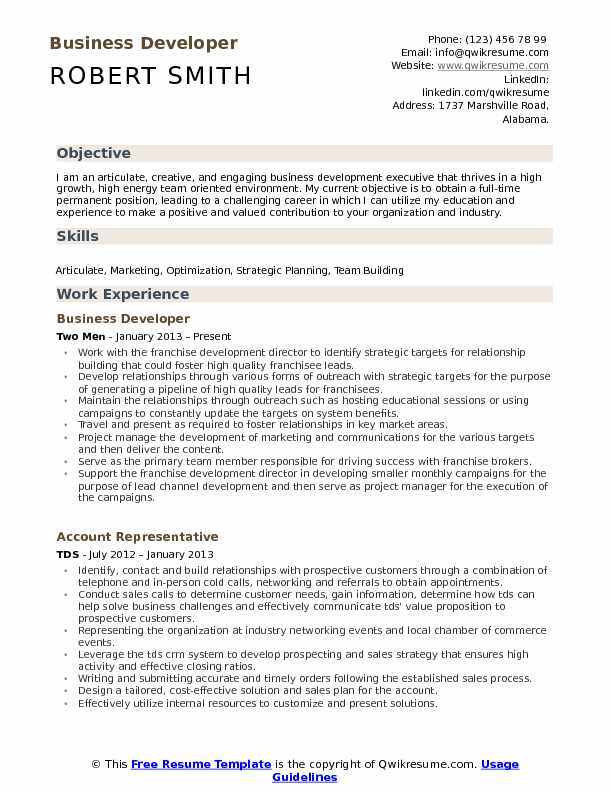 Project manage the development of marketing and communications for the various targets and then deliver the content. Serve as the primary team member responsible for driving success with franchise brokers. Support the franchise development director in developing smaller monthly campaigns for the purpose of lead channel development and then serve as project manager for the execution of the campaigns. Assist in development and implementation of yearly franchise development plan. Create content as requested for franchise development social media efforts and website in support of lead channel development. 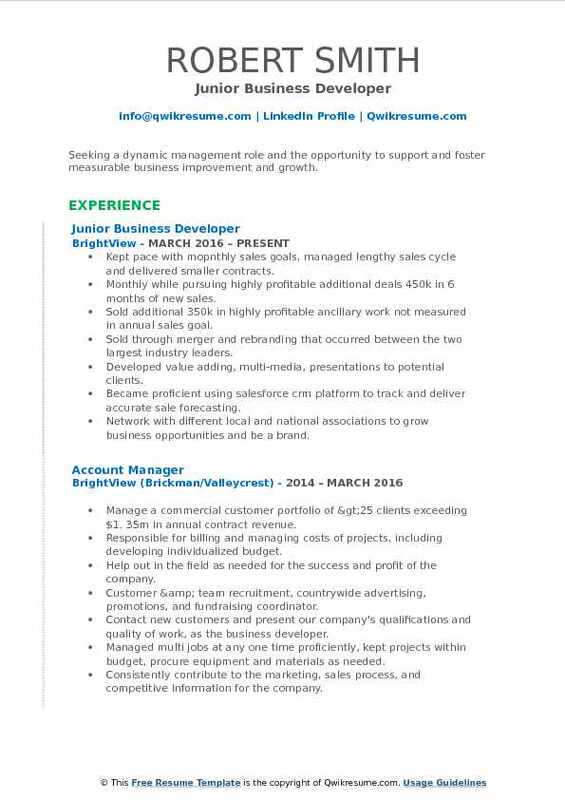 Aid the franchise development director as needed in saleforce. Com and other efforts for general lead generation and help project manage the efforts. Serve in a backup capacity for franchise developer in times of absence or high volume of prospects. Lead at least one strategic franchise development project per year in support of overall team and company success. Objective : Top performing Sales and Management professional with proven ability to drive business growth through aggressive sale initiatives that deliver revenue growth, market share, and market penetration. Proven ability to demonstrate as well as lead and motivate others to achieve company goals. Significantly increased business with existing high volume wholesale school supply accounts through successful negotiations with local and national school districts. Actively execute sales, marketing, and promotional programs to meet expected sales and revenue metrics. Implemented coaching and mentoring programs and facilitated formal training when needed. Identified new revenue opportunities from heavy volume in-field and telephone prospecting. Identified talent and evaluated skill level. Interviewed and hired applicants, negotiated pay rates and staffed job orders. Implemented strategic sales plan to achieve competitive advantages and create value. Spearhead business development and generated referrals through building trusted relationships with key decision makers, influencers and provided exceptional and responsive service. Established a strong customer base of 30 accounts within 6 month period. Developed new territory and generated monthly census through high volume in-field cold calling, marketing and educating referral sources about products and services. Conducted meetings and in-service presentations. 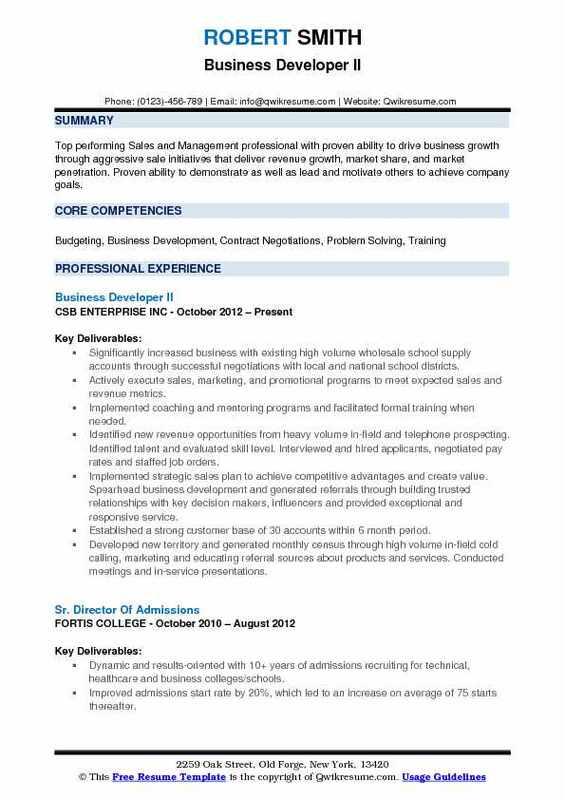 Summary : Seeking a position where I can utilize my exceptional leadership and communication and organizational skills. Skills : A Committed Leader With Reliable, Professional, And Motivated Qualities That Allow Me To Complete Tasks Efficiently. Welcome Challenges, Organized, Detailed Oriented And Able To Multi Task. 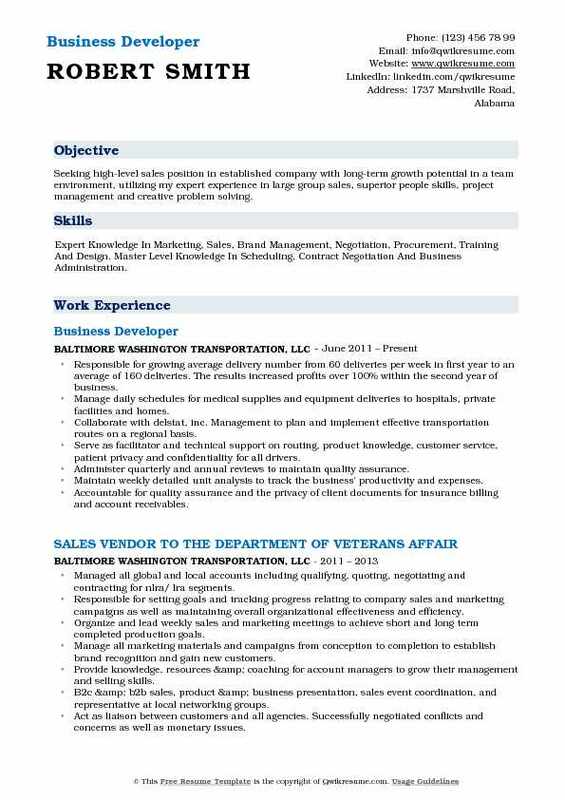 Responsible for conducting new business deals by coordinating requirements; developing and negotiating contracts; integrating contract requirements with the department of defense, regional contracting centers and state department. Participate in the development of the corporation's plans and programs.. Objective : Seeking a dynamic management role and the opportunity to support and foster measurable business improvement and growth. Kept pace with mopnthly sales goals, managed lengthy sales cycle and delivered smaller contracts. Monthly while pursuing highly profitable additional deals 450k in 6 months of new sales. Sold additional 350k in highly profitable ancillary work not measured in annual sales goal. Sold through merger and rebranding that occurred between the two largest industry leaders. Developed value adding, multi-media, presentations to potential clients. Became proficient using salesforce crm platform to track and deliver accurate sale forecasting. Network with different local and national associations to grow business opportunities and be a brand. Coordinate with additional business developers across territory lines to sell larger contracts. Coordinate execution with operations team to satisfy company and client needs. Headline : Talented, results-producing professional with expertise in selling, planning, marketing and directing multiple segments. Focused on developing top-performing accounts, prospecting new customers, and increasing overall revenues. Develop proactive digital marketing strategies to help brands grow awareness, increase lead. Generation, and on going communication with existing and future clientele. Engage in consultations with owners, executive committees and marketing teams on their. Maintain high levels of product and service knowledge, clearly communicate appropriate. Product features and benefits and other elements of business services. Continuously improve on key selling skills including: partnering with the gatekeeper, greeting. Decision- maker, understanding needs, positioning product and value, and sell and close. Effectively manage pipeline; organize and plan daily sales route to maximize productivity. 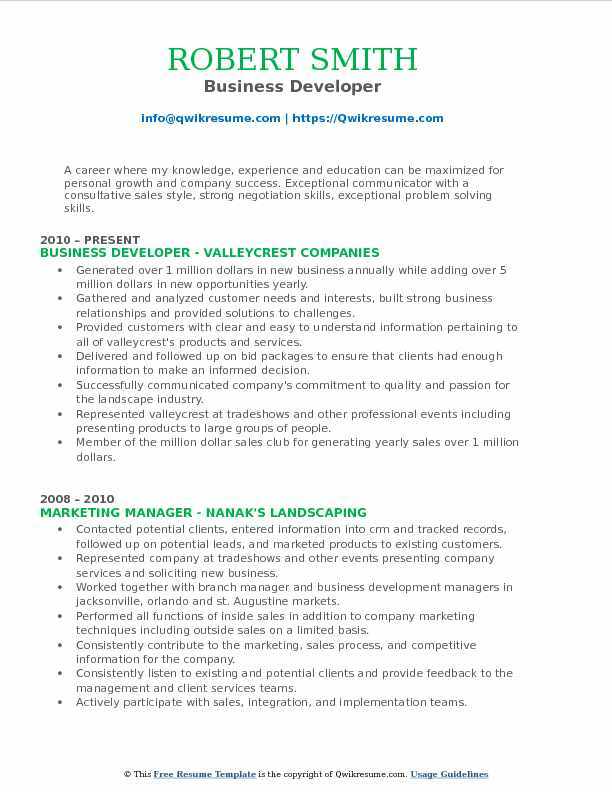 Headline : Seeking high-level sales position in established company with long-term growth potential in a team environment, utilizing my expert experience in large group sales, superior people skills, project management and creative problem solving. Skills : Expert Knowledge In Marketing, Sales, Brand Management, Negotiation, Procurement, Training And Design. Master Level Knowledge In Scheduling, Contract Negotiation And Business Administration. Responsible for growing average delivery number from 60 deliveries per week in first year to an average of 160 deliveries. The results increased profits over 100% within the second year of business. Manage daily schedules for medical supplies and equipment deliveries to hospitals, private facilities and homes. Collaborate with delstat, inc. Management to plan and implement effective transportation routes on a regional basis. Serve as facilitator and technical support on routing, product knowledge, customer service, patient privacy and confidentiality for all drivers. Administer quarterly and annual reviews to maintain quality assurance. Maintain weekly detailed unit analysis to track the business' productivity and expenses. Accountable for quality assurance and the privacy of client documents for insurance billing and account receivables. Manage the partnership with delstat, inc. To ensure effective working relationship between both parties. Summary : A career where my knowledge, experience and education can be maximized for personal growth and company success. Exceptional communicator with a consultative sales style, strong negotiation skills, exceptional problem solving skills. Generated over 1 million dollars in new business annually while adding over 5 million dollars in new opportunities yearly. Gathered and analyzed customer needs and interests, built strong business relationships and provided solutions to challenges. Provided customers with clear and easy to understand information pertaining to all of valleycrest's products and services. Delivered and followed up on bid packages to ensure that clients had enough information to make an informed decision. Successfully communicated company's commitment to quality and passion for the landscape industry. Represented valleycrest at tradeshows and other professional events including presenting products to large groups of people. Member of the million dollar sales club for generating yearly sales over 1 million dollars. Summary : An accomplished and pragmatic professional with a comprehensive background in business development, sales and marketing, account management, and operations management in a corporate environment. Dynamic at increasing sales performance, generating repeat business, and growing profitability. 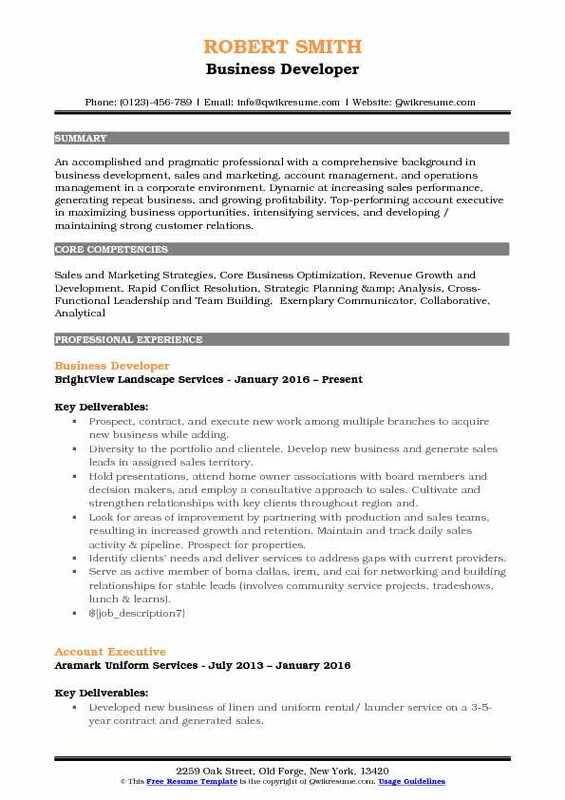 Top-performing account executive in maximizing business opportunities, intensifying services, and developing / maintaining strong customer relations. Prospect, contract, and execute new work among multiple branches to acquire new business while adding. Diversity to the portfolio and clientele. Develop new business and generate sales leads in assigned sales territory. Hold presentations, attend home owner associations with board members and decision makers, and employ a consultative approach to sales. Cultivate and strengthen relationships with key clients throughout region and. Look for areas of improvement by partnering with production and sales teams, resulting in increased growth and retention. Maintain and track daily sales activity & pipeline. Prospect for properties. Identify clients' needs and deliver services to address gaps with current providers. Serve as active member of boma dallas, irem, and cai for networking and building relationships for stable leads (involves community service projects, tradeshows, lunch & learns). 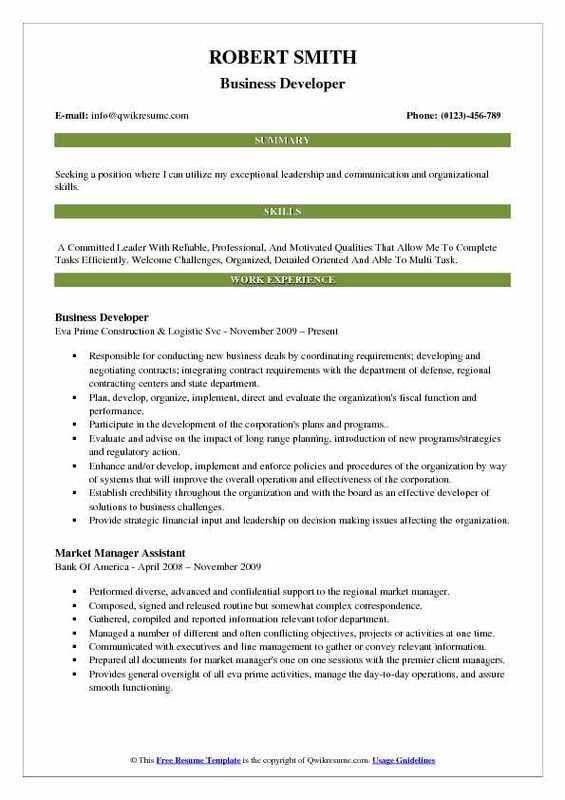 Headline : Highly proficient and accomplished management professional with over 7 years of management experience with several international companies. Proven ability to create and lead successful programs and teams. Superb conflict resolution and customer relations skills. Communicate industry trends and areas of strategic business growth to president. Develop business relationship, understanding of customer needs to deliver quotes, terms, price increases and payment collection, any changes in ship dates, expedite requests,. Summary : Experienced cultivating strategic engagement, mission delivery, building partnerships to generate donations and obtain funding. Can drive, negotiate and manage new accounts to deeper engagement. Excel at building relationships. Raised $2 million in capital for new pharmacy building in 15 months while raising $1. 6 million in galen. Society scholarship funds for pharmacy students from wisconsin foundations and associations. Established the cuw osp in august 2011, and facilitated faculty grants of $3. 4 million in 3 years. Efforts resulted in raising the profile of the school of pharmacy research initiatives in s/e wisconsin community. Prepared monthly grant pipeline for leadership and promoted the office internally to drive grant submissions. Lead generating, network & social media marketing, business operations, and independent consultant. Bulletins, and marketing brochures. Participating in creation of new company website.